In medium bowl, mix beef, bread crumbs, 1 tablespoon of the steak sauce, the egg, salt and pepper. Using rounded tablespoon measure, shape 20 meatballs (about 1 1/2-inch diameter). Refrigerate 1 hour. Heat 12-inch nonstick skillet over medium heat. Add meatballs; cook 12 to 14 minutes, turning frequently to brown on all sides, to internal temperature of 160°F. Remove from heat; add remaining 2 tablespoons steak sauce and the water, and gently stir to coat. 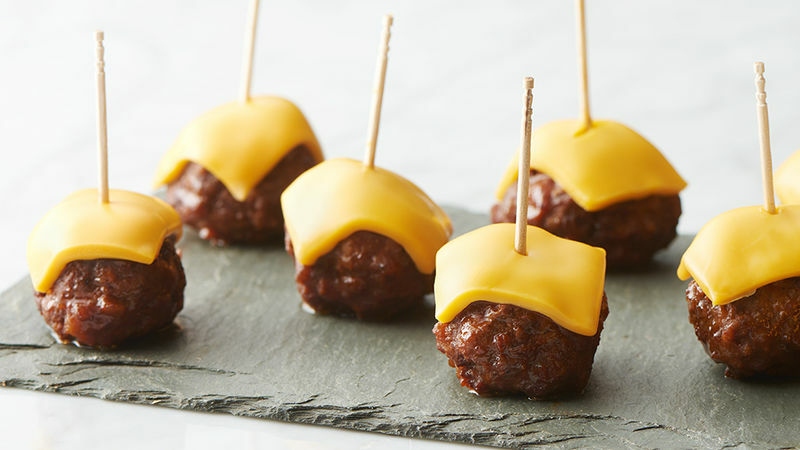 Top each meatball with cheese square; cover 1 to 2 minutes or until cheese melts. Insert toothpick in each meatball, and serve. Refrigerating meatballs helps them hold their shape during cooking. Lean ground beef (80%) is used in this recipe for a moist and juicy meatball.